1. Aroldis Chapman – LHP – CIN – 6’4″ 185 – 2.28.88. Signed: Cuba 2009. Who throws 105 mph? Aroldis Chapman and Sidd Finch, that’s who! 2. Chris Sale – LHP – CHW – 6’5″ 170 – 3.30.89. College: Florida Gulf Coast Drafted: 1st Round (13th Overall) 2010. Sale’s long term future may be in a rotation but he shouldn’t leave the bullpen anytime soon. Like Chapman, Sale can help a contender win now so his long term development is secondary. 3. Kenley Jansen – RHP – LAD – 6’6″ 220 – 9.30.87. Signed: Curacao 2004. We all remember Jansen as a light hitting riffle armed catcher on the Netherlands WBC team that shocked the Dominican Republic. 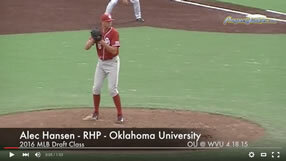 Now a pitcher, Jansen posted 15.6 K/9 in minors and 13.7 K/9 majors in 2010. If Jon Broxton can’t fix his noggin, Jansen might be closing by year end. 4. Tanner Scheppers – RHP – TEX – 6’4″ 200 – 1.17.87. College: Fresno State Drafted: 1st Round Supplemental (44th Overall) 2009. Scheppers was part of the 2008 Fresno State National Championship team but was hurt down the stretch which caused the top 10 talent to slide to the Pirates in the 2nd round. He didn’t sign, made a few appearances in Indy Ball and improved his stock the following year. 5. Craig Kimbrel – RHP – ATL – 5’11” 200 – 5.28.88. College: Wallace State CC (AK) Drafted: 3rd Round 2008. The retirement of Billy Wagner could spell Rookie of the Year for Kimbrel.